The dimmer switch is rated for the same voltage as the lighting application. Use standard dimmers on 120 line voltage and low voltage dimmers for 12V and 24V applications. The total wattage of all lamps is less than or equal to the maximum wattage rating on the dimmer switch. If you're dimming one bulb, this probably isn't a problem. But for track lighting or recessed can lights where more than one bulb is controlled at the same time, you need to add up the total watts for all lights. For example, a 600 Watt incandescent dimmer can support up to eight 75 Watt bulbs. LED and fluorescent dimming works a little differently. It's a common misconception that any LED dimmer can be paired with any dimmable LED light bulb. Unfortunately that is not the case and the same is true of dimmable fluorescent bulbs paired with fluorescent dimmers. The easiest way to ensure that your light bulbs and dimmer controls are compatible is to check the lamp's manufacturer spec sheet or dimmer compatibility sheet. 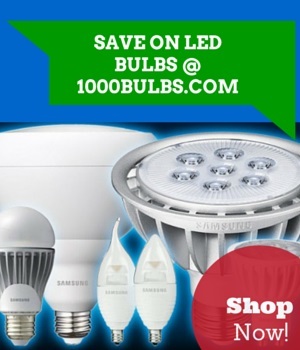 At 1000Bulbs.com, these PDFs available under Brochures & Spec Sheets on the lamp's product page. If you have a dimmer switch already and are looking for new bulbs, check to see that the dimmer is listed on the PDF prior to purchasing the bulbs. If you already have light bulbs and are looking for a dimmer switch, find the product page for the bulbs and check the PDF for a list of compatible dimmers to choose from. The specific dimmer compatibility information will always be with the bulbs rather than with the dimmer. If your dimmer isn’t listed on the dimmer compatibility sheet, don’t lose hope. The compatibility sheet will often list common dimmers or whole lines of dimmers by the manufacturer part number or catalog code. It is also possible that the bulbs you are using just haven’t been tested with that specific dimmer switch. If you need confirmation of partial or full compatibility, contact the manufacturer of your bulbs to verify. If you experience any of these symptoms, turn off the lights and troubleshoot because chances are there's nothing wrong with the dimmer or the lights, the two just aren't meant to be friends. First, make sure that your lights are dimmable. Trying to dim something that isn't dimmable isn't good for your lights, the dimmer switch, or your sanity. Double check compatibility between lamps and dimmer. Check that the maximum wattage of the dimmer has not been exceeded. Have an electrician check the fixture. If you've just replaced fluorescent lights and the new lights are also having trouble, but you're sure the lights and dimmer are compatible, a plausible cause is the ballast in the fixture is nearing the end of its life. The symptoms of a bad ballast also include flickering and humming, so if everything is compatible, hiring an electrician is the best next step. We've also had cases where the fixture was running on a higher voltage than indicated by the socket, which brings us to low voltage dimming. Low voltage lighting is common in residential and commercial lighting, including display lighting, track lighting, and landscape lighting. The low-voltages extend lamp life and increase safety, especially for landscape lighting where a poorly buried wire is at risk of being hit by weed choppers or lawn mowers. When dimming low voltage bulbs, a magnetic or electronic transformer is needed to step down the voltage. What dimmer you need is determined by the transformer. Do not mix magnetic and electronic transformers or dimmers on the same circuit. Use magnetic low voltage dimmers with magnetic transformers and electronic low voltage dimmers with electronic transformers. Keep each on their own line, separate from one another. One method originally designed for CFLs that is now also used for dimming LED lamps is 0-10 Volt dimming. Fixtures setup for 0-10V dimming have a third wire that applies a direct current voltage (DC) between 0 and 10 Volts to vary the intensity of the light. For a fixture to be compatible with 0-10V dimming, it needs to have a 0-10V LED driver. This may be included in the fixture, or external as is the case with LED tape light. In many cases, if the fixture is compatible with 0-10V dimming, you can use any 0-10V dimmer compatible with that technology. Because 0-10V dimmers all work the same way, some products are compatible with all 0-10 Volt dimmers. If this is the case for a product listed on 1000Bulbs.com, we write this in the description, but you can also find it on the PDFs as well. If you're not sure what type of dimmer you need, you can call our lighting experts at 1-800-624-4488 or leave us a comment below. Our team is happy to assist you in pairing the right bulbs and dimmer controls.